Easter Island is the southeastern most of the Polynesian Islands and the most remote. It got its name because Dutch explorers landed there on Easter Sunday, 1722. Local inhabitants of the island call it by the Polynesian name Rapa Nui. Easter Island is famous for its 887 stone monuments, called moai, which give the island a supernatural quality. These monolithic human figures are finely crafted and reminiscent of Incan stonework, yet they were carved between the years 1250 and 1500 AD which predates the Incans. Almost half are still at the main moai quarry, but hundreds were moved from there and set on stone platforms around the perimeter of the island. 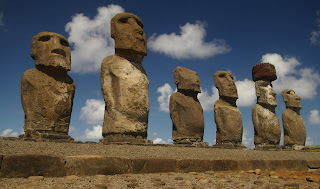 The moai have disproportionately large heads which represent the faces of deified ancestors. The statues faced inland overlooking their tribes, but most were toppled during conflicts between clans. The production and transportation of these statues is quite a remarkable feat, considering some reach a height of nearly 10 meters and weigh more than 75 tons. Anthropologists know that Easter Island was once heavily populated, yet no one is certain about what happened to these people. One recent theory is that overpopulation precipitated an ecological catastrophe which caused natural resources to become depleted. Research suggests there were millions of palm trees on Easter Island but they disappeared sometime before the arrival of European explorers. Early explorers also brought rats to the island which may have prevented the regrowth of these trees by eating the palm nut seeds. As the island was deforested, soil erosion made it difficult to sustain vegetation. A problem that continues even now. While ecological problems did play a large part in reducing the population from a high of 15,000 to about 3,000 inhabitants, the final blow to these people came in the form of slave trade and disease. Peruvian slave traders made several trips to the Island during the 1860s, capturing about half of the remaining inhabitants. Forced to work as laborers and servants, many died soon after they were taken from their home. Slave traders, whalers and missionaries also brought small pox and tuberculosis. By the end of the decade only 111 natives remained on the island and most of their cultural history was lost. what they might have meant. 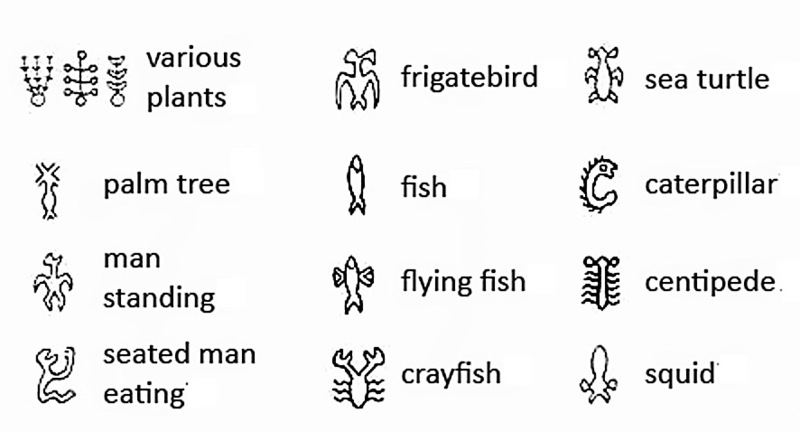 Also lost was the ability to read and write the rongorongo script, a system of glyphs discovered on Easter Island and the only Polynesian writing to have ever been found. The last few people that knew how to read and write it were among those captured and enslaved. While there have been many attempts to decipher this writing, none have been successful. How unfortunate that we cannot read one of the very few independent inventions of writing in human history and which would likely reveal many secrets of Easter Island. 1) Easter Island got its name from Portuguese explorers who discovered it in 1722. 2) The stone monuments of Easter Island, or moai, represented _____________________. 3) True or false: Native inhabitants of Easter Island fell victim to disease, enslavement and loss of natural resources. 4) Trees could not regrow on the island because of ________. 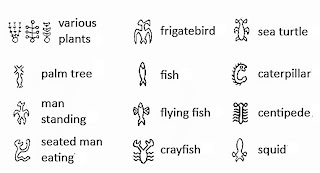 5) Rongorongo is the only form of Polynesian ______________.